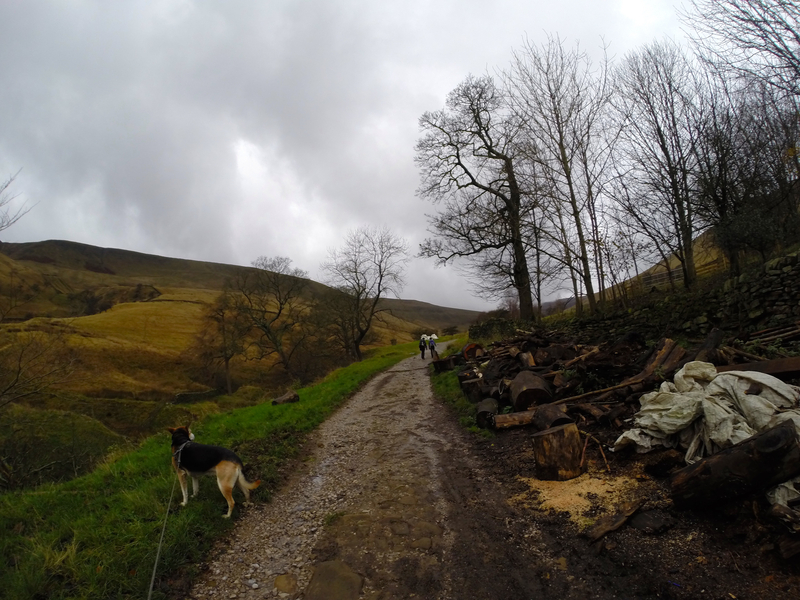 We had set off from Edale 4 hours or so earlier, with me wondering if the dog was up to the 5 hours circular walk. 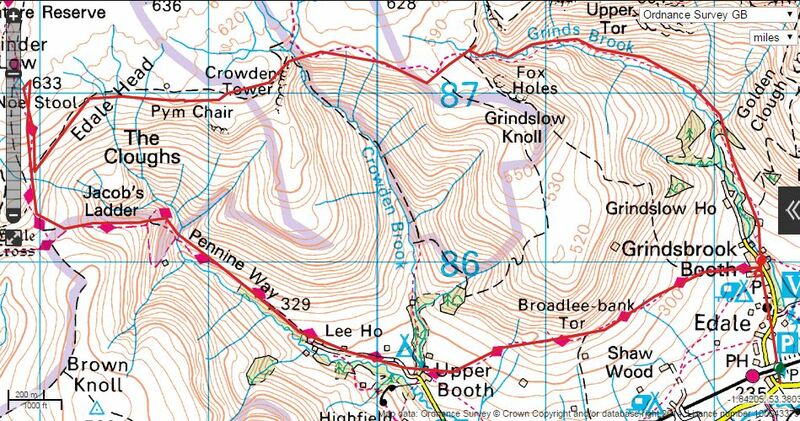 The route was about 8 and a bit miles and allowing for some mooching about. 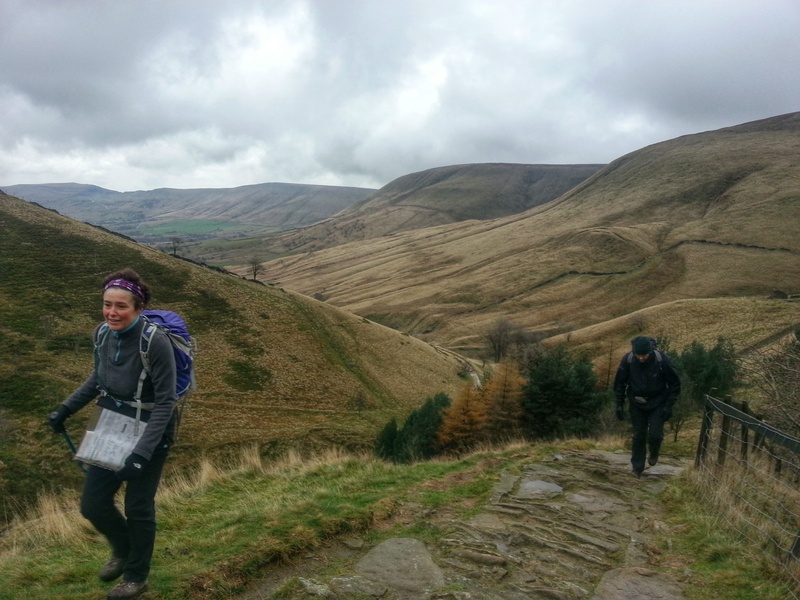 There was to be quite a bit of climb via Jacob’s Ladder, along part of the Pennine Way and up to the plateau of Kinder Low and I was concerned that she might find it a bit much. 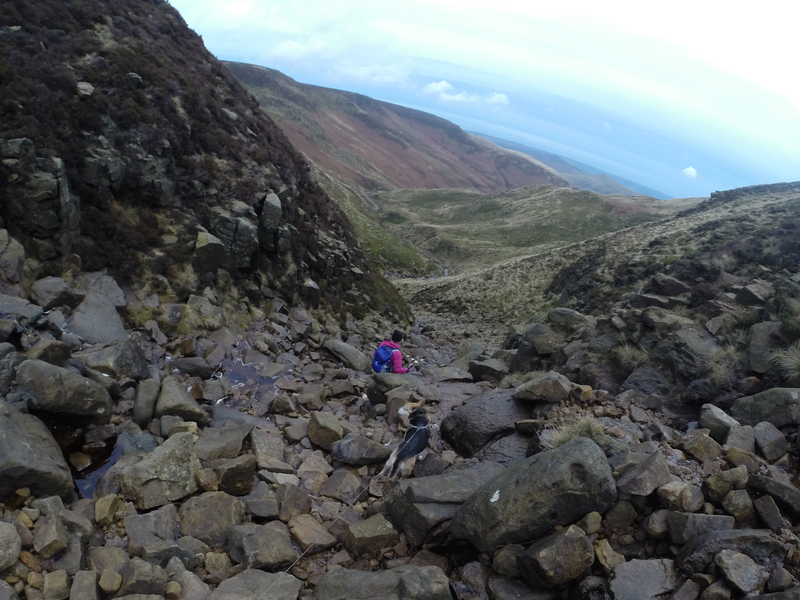 We haven’t had that many ‘proper’ hikes for a while and I’m mindful of the growing amount of time she snoozes during the day and the pace she has slowed down to when out on walks. 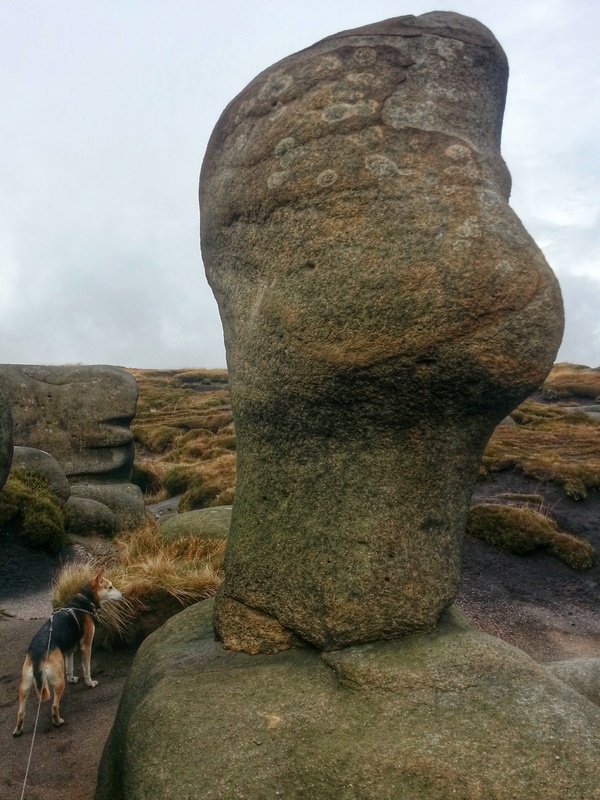 It’s all relative though and her four legs were better than my two.. she had more energy than me! 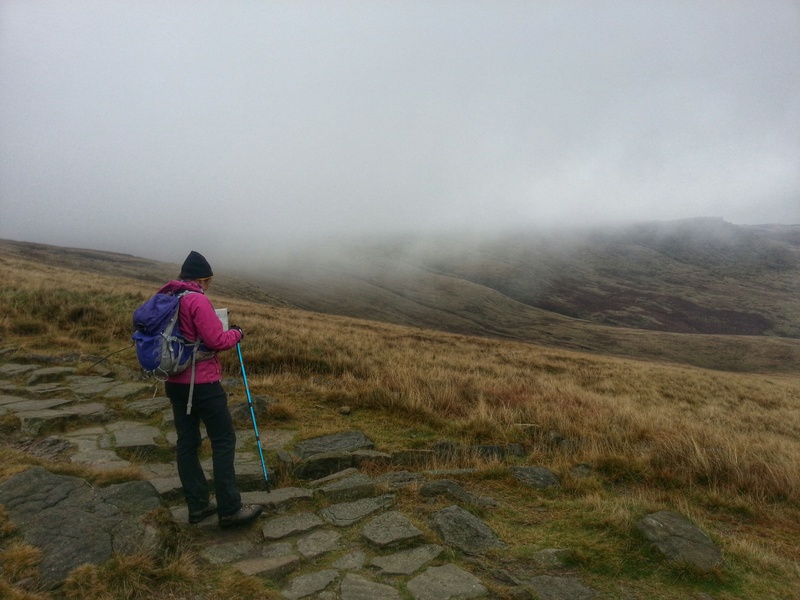 And I think the scent of sheep and grouse dotted around the misty landscape spurred her on throughout the walk. 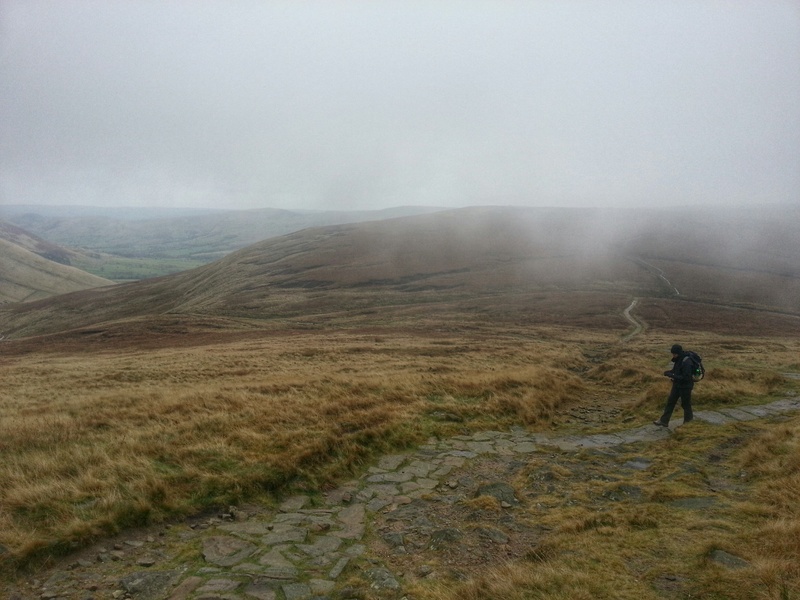 The previous time I was up on Kinder Low it was also foggy. 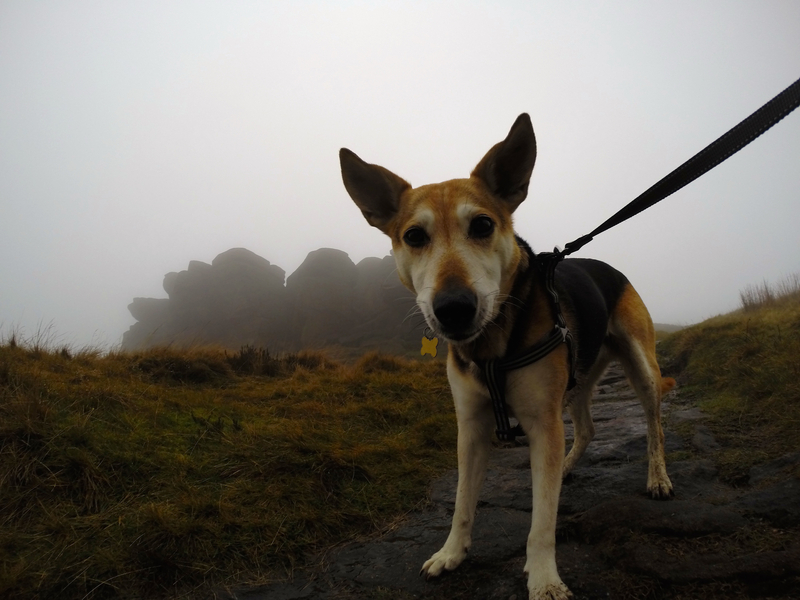 Actually Sunday’s walk was in low cloud / mist rather than a foggy pea-souper. 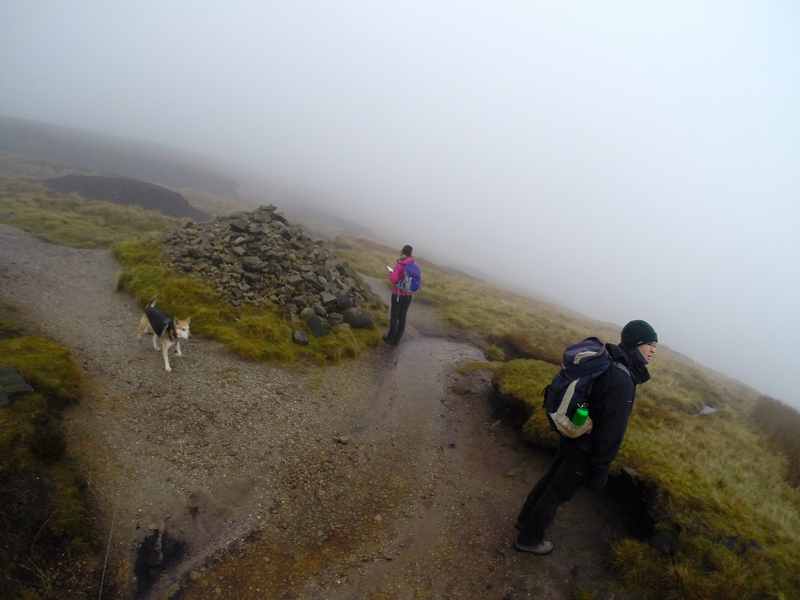 That trip years ago really was foggy.. 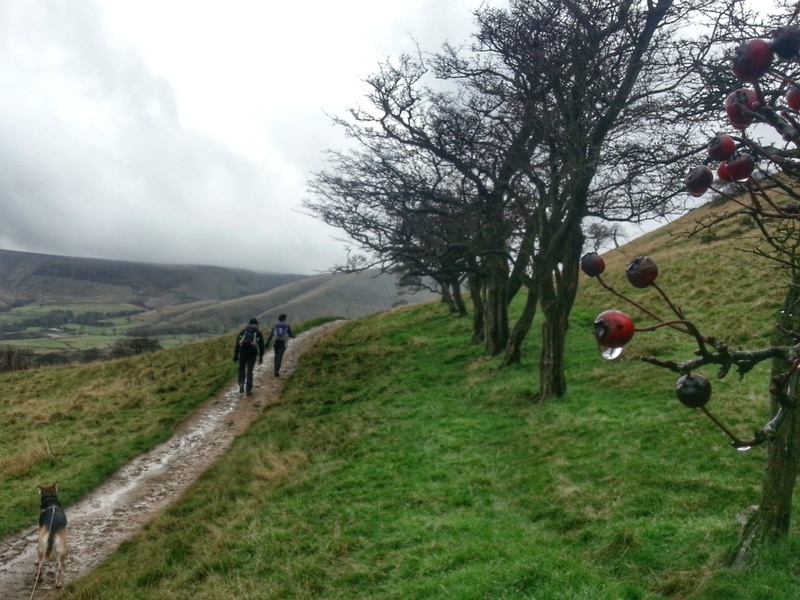 I was with a bunch of other young dad’s, checking out the camping facilities in Edale before we descended with the families for a weekend of outdoors-y-ness. 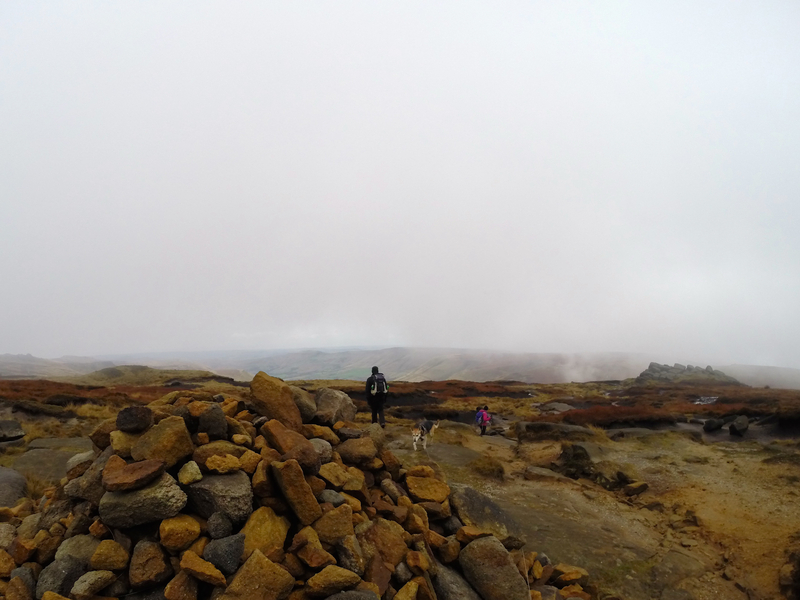 Obviously no checking out was really required – but with Marsden only being an hour or so away, we had decided we’d head over for a walk up on the tops of Kinder Scout and Kinder Low and then hit the pub in the evening, before camping for the night. No creaking knee or Achilles tendon for me in those days. 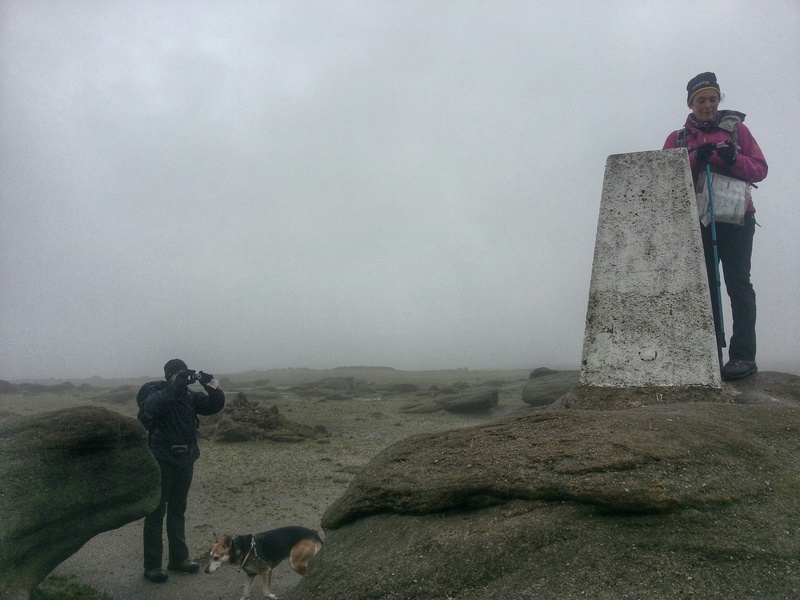 What actually happened was a lot of stumbling about in the thick fog between moonscape rocks before we navigated our way off the plateau and back to an early (pub) tea. 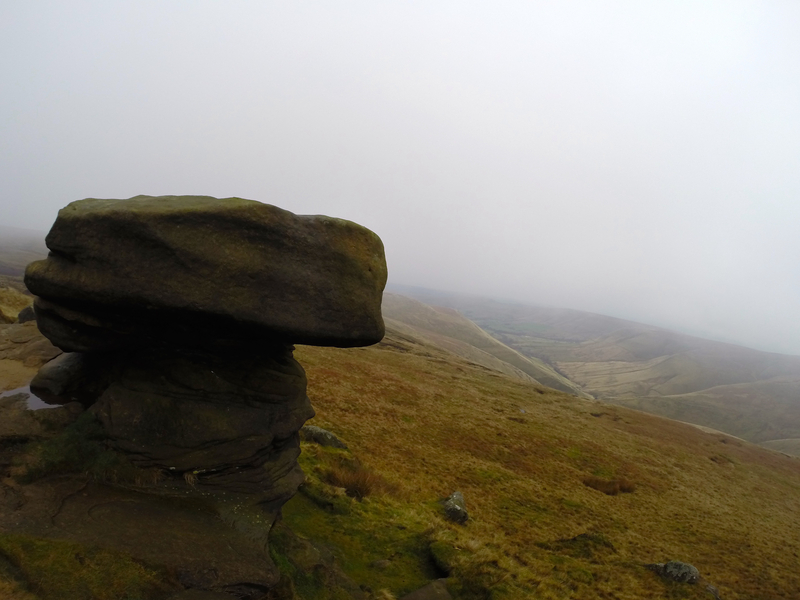 This time around, the rocks of Noe Stool, Crowden Tower et al were unchanged (the time elapsed between visits being close to zero in geological time of course) and the weather was marginally better although not exactly clear skies. 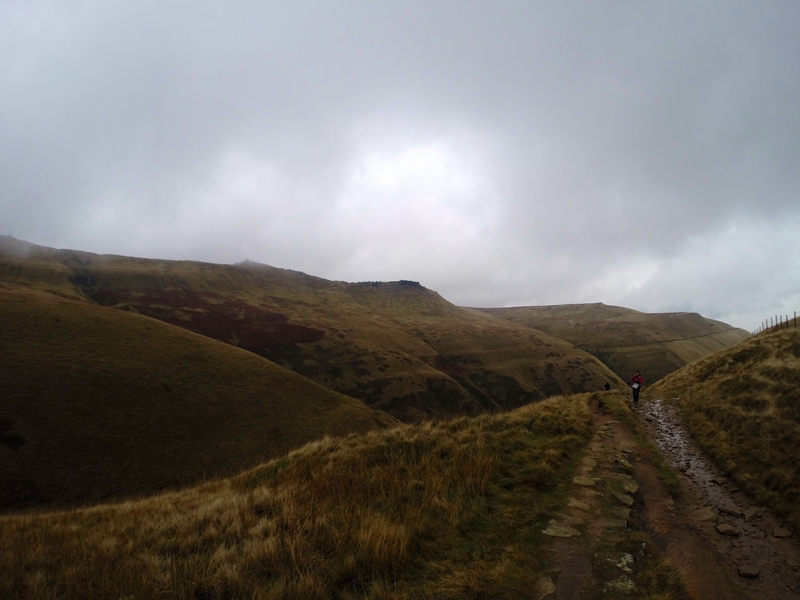 It made for an atmospheric hike in any case. 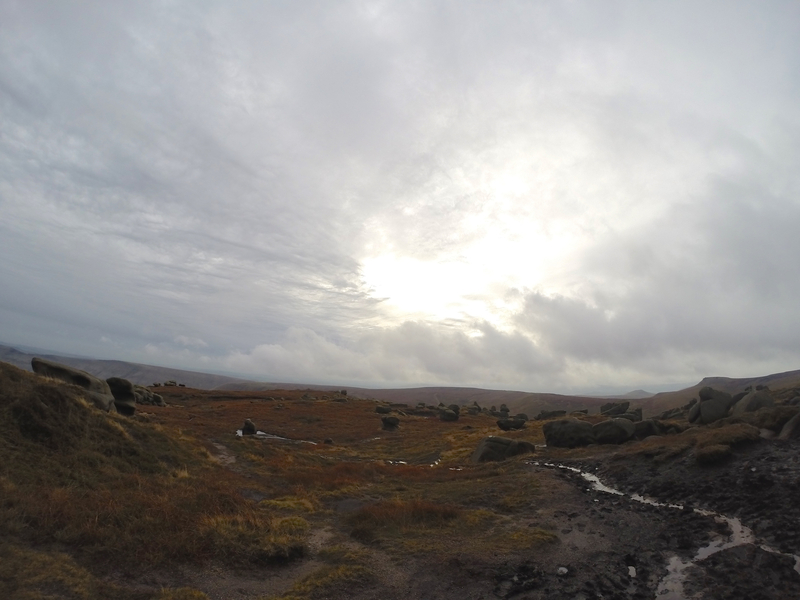 And the sun started to burn through around 1.30pm, so we had some clarity of view for the latter leg of the walk. 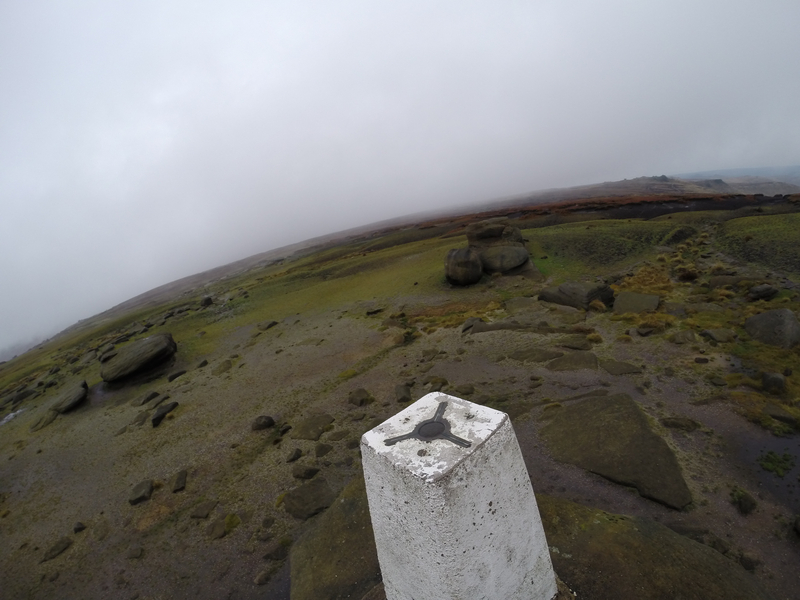 We had a short boomerang around Kinder Low Trig, to be able to bag three elevations above 600m in one walk. 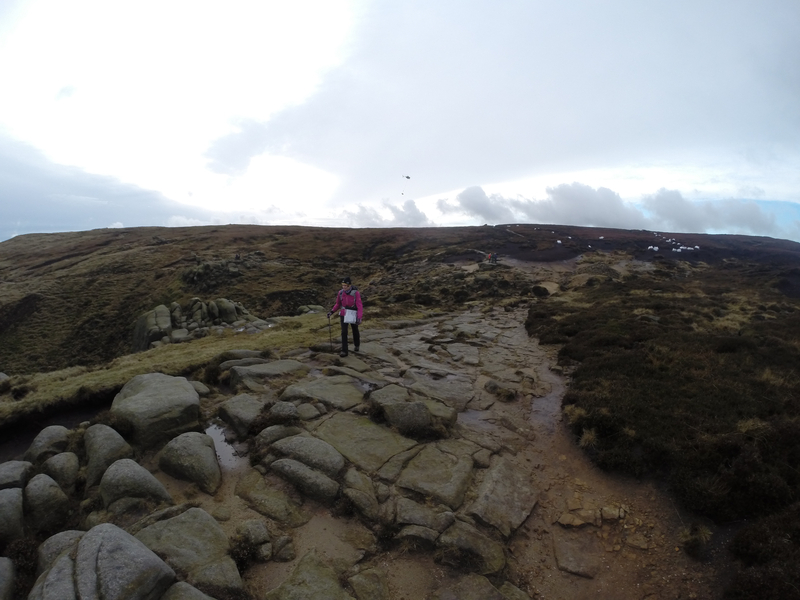 We could have extended the walk to take in Kinder Scout .. but shorter daylight hours and all that. 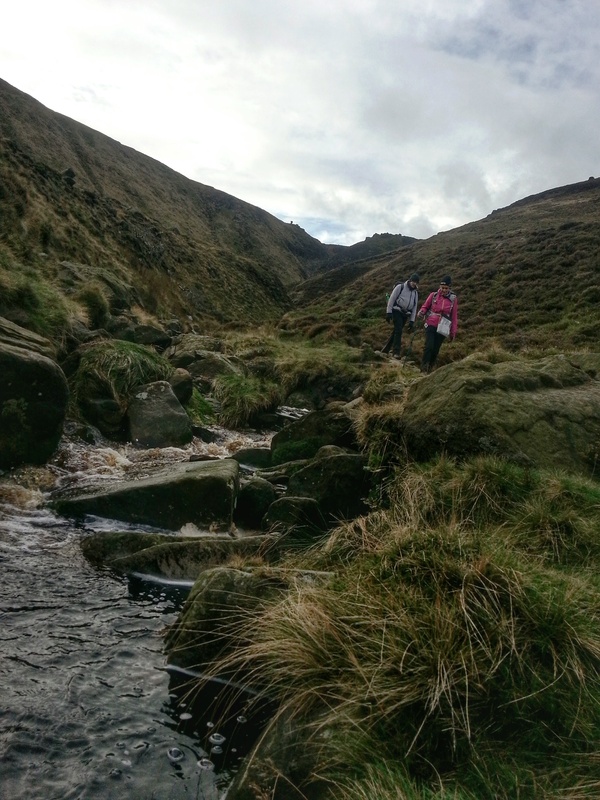 I was surprised to see people (in jeans on a couple of occasions) still heading up Grindsbrook Clough as we were coming down. 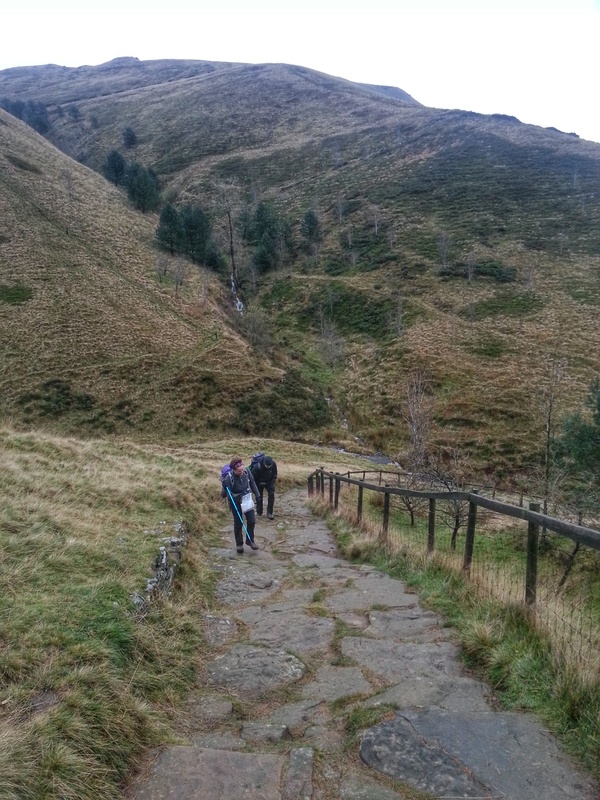 And photos from the hike, in route order..
On Jacob’s Ladder, I found it a bit of a haul. 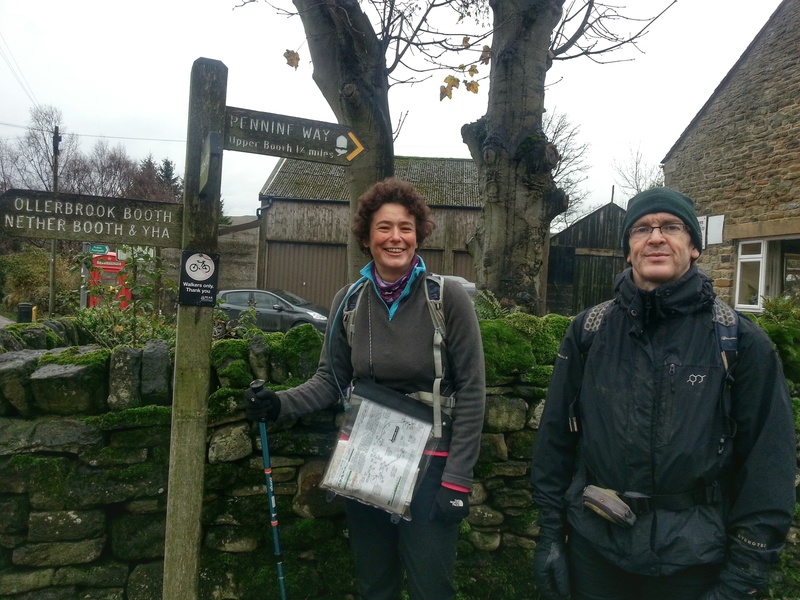 And Jenny and Karl (pictured) had been back too long from a jaunt to Peru for the oxygen level advantage to help..
Me, get me! 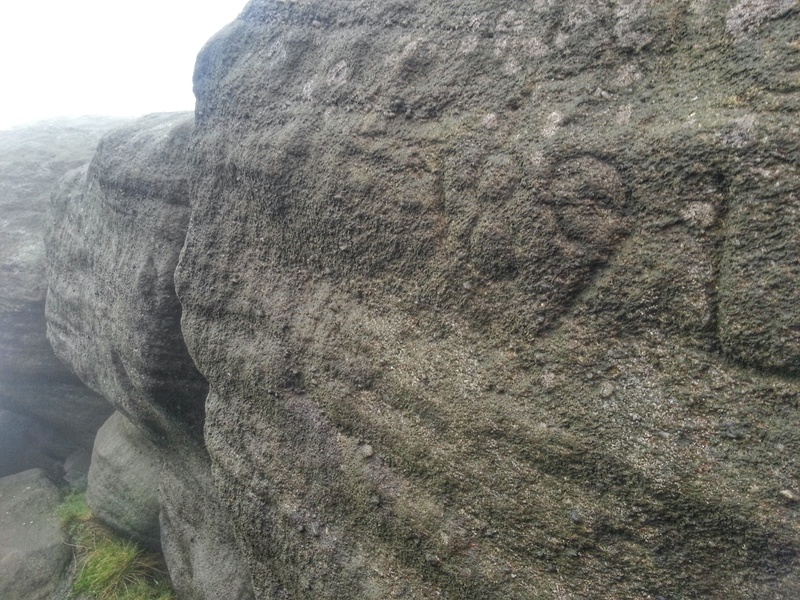 not those rocks. 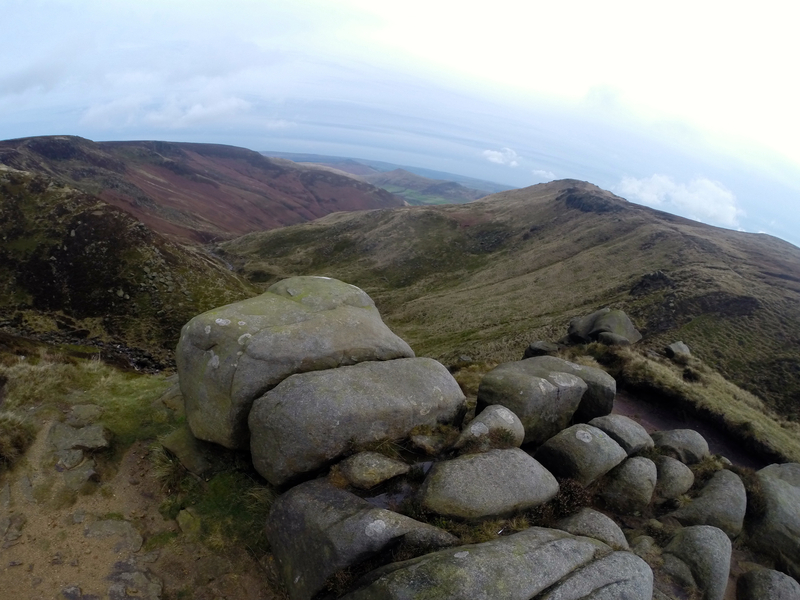 The cairn where the path divides towards Kinder Low Trig, the Pennine Way (and Kinder Scout) or along the Kinder Low escarpment / towards Grindsbrook Clough. 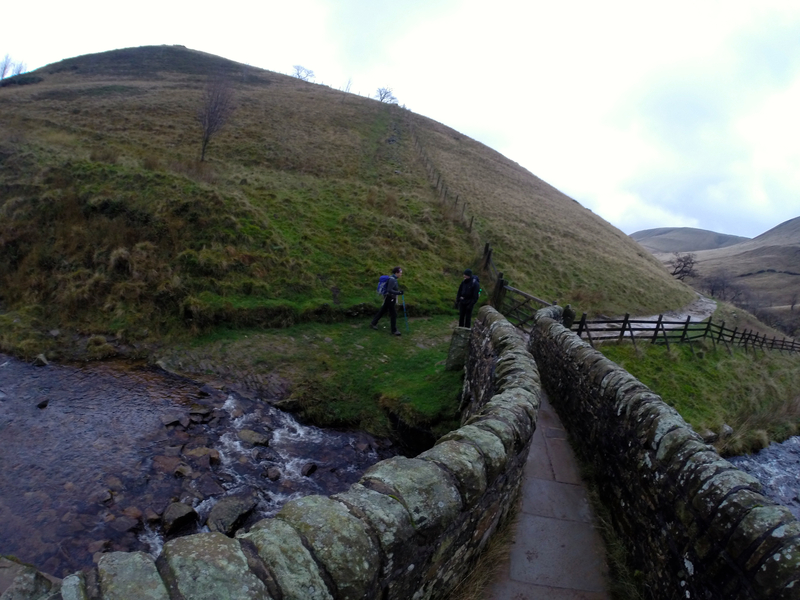 As big as a roundabout.. 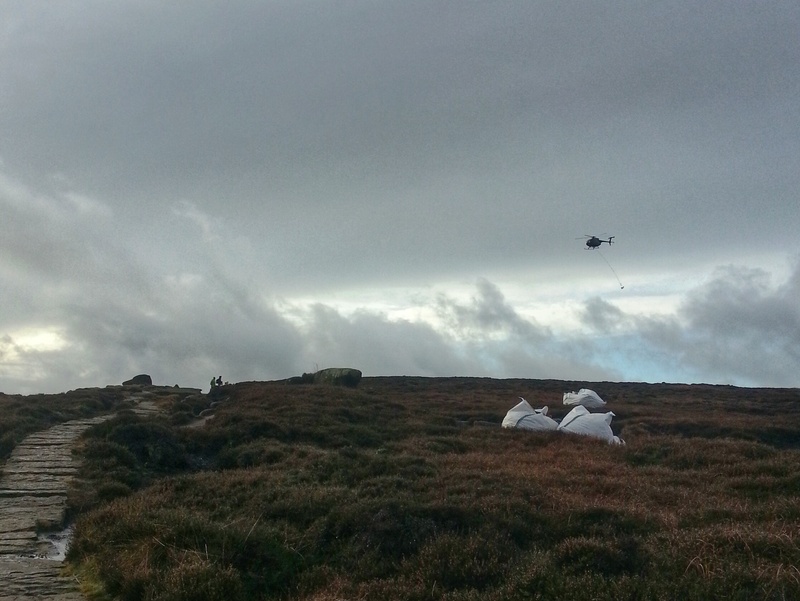 The Peat seems very sparse near the trig.. a really busy area I think. 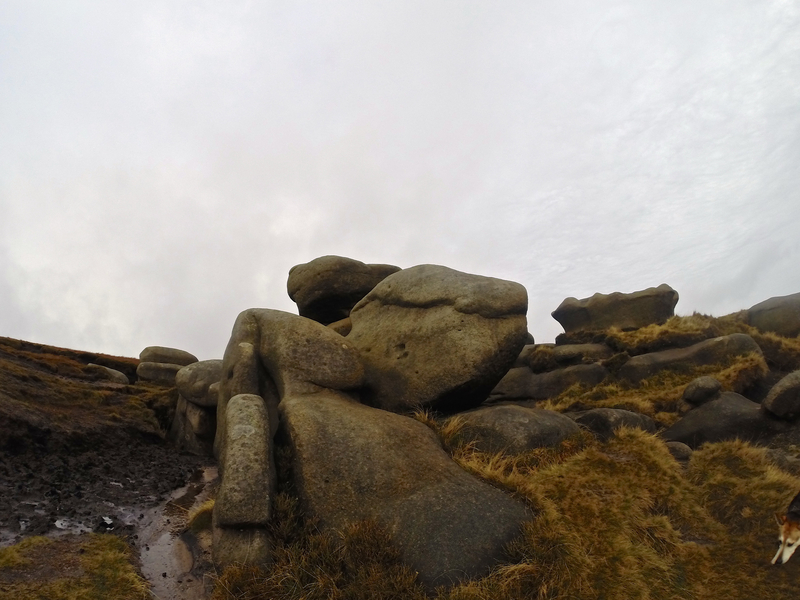 I’m not sure if the rocks are erratics left from the retreat of the last ice age or are part of the bigger gritstone rock mass under the peat and have were shaped by glacial meltwater then the following10,000 winters of high winds and rain? 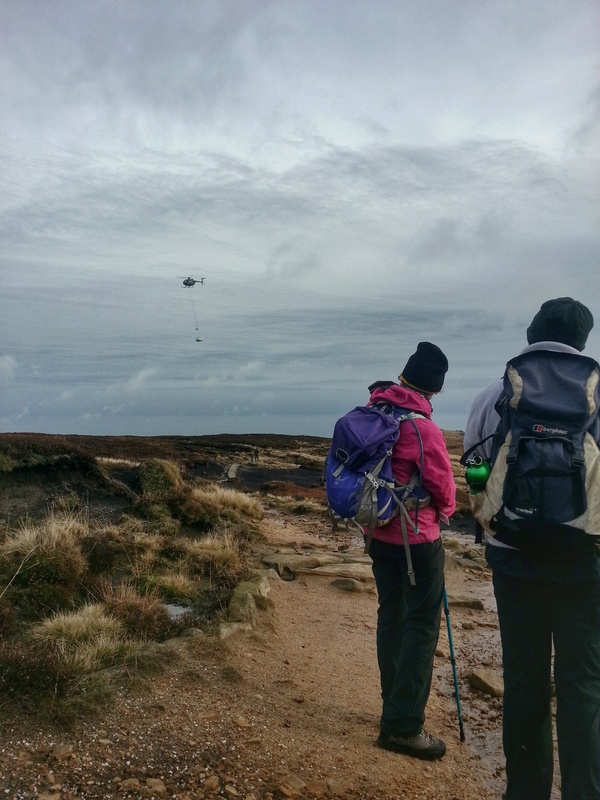 The dot behind Jenny was the National Trust helicopter ferrying in bales of what I think was heather for reseeding parts of the bare peat.. or maybe other material for damming up some of the water courses to stop water loss. So sorry I missed this one. It looks like you had a great walk.